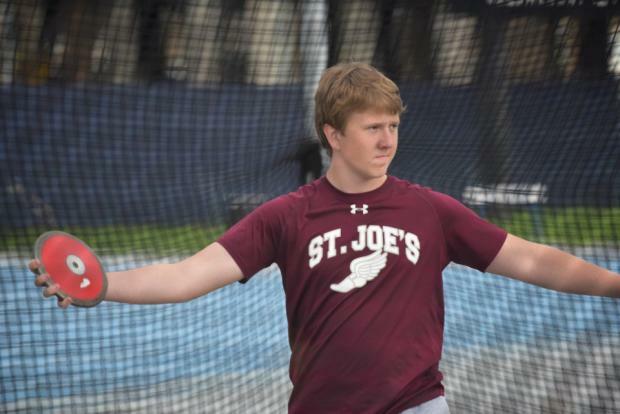 William Gross (St. Joseph Collegiate Institute) has never been that hulking, massive individual that has been a staple among the hammer and weight throwers in high school track and field. He certainly wasn't that as a freshman at St. Joseph Collegiate Institute (5-foot-9, 160 pounds) and he's still not the prototypical offensive lineman who spends his winters throwing weights as a way to stay in shape for football. 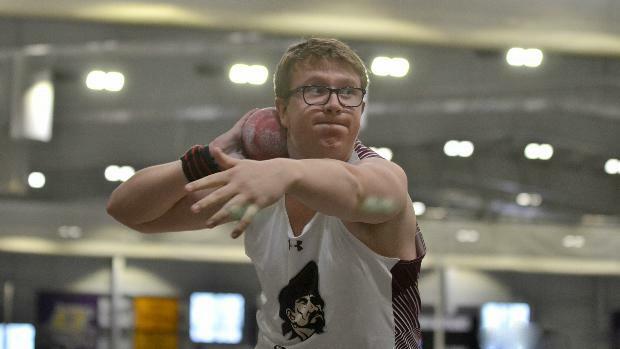 Yet Gross, who is 6-1 and 230 pounds, has been able to dissolve the stereotype often associated with throwers and not let his size, or lack thereof, prevent him from becoming one of the best throwers in New York. The senior is the top-ranked weight thrower in the state, having won all five meets in which he has entered this season. 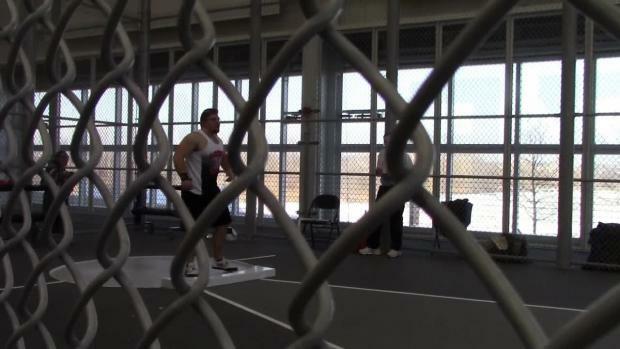 That includes throwing for a personal-best and state-high 67 feet on Dec. 1 at The Lancaster Throwers Meet. That distance also places him 11th in the country this season through Jan. 10, according to milesplit.com. "When I was a freshman, I wasn't anything special," said Gross, who placed 11th in the 2018 NYSPHSAA championships. "I was pretty small. I think my first shot was 22 feet and I've more than doubled that. When I started weight throwing as a sophomore I was throwing maybe 36 feet and now I'm near 70. "It definitely hurts being small when you're throwing because it's usually those big tough guys. As a freshman, I saw they were bigger than me. They beat me for the last three years but now I'm finally winning because I have worked hard, I've learned a lot and I've gotten stronger. It's gotten me where I am today." That Gross, 17, and his teammates don't have an indoor facility at St. Joe's in which to train doesn't seem to have slowed him much. He and his teammates are like nomads during the week, training at a local community before heading back to school to lift weights. Even then, Gross only gets to work on his throwing early in the week and more often than not it is several days between his workouts and the weekend meets. "That's kind of been the whole thing with the weights the last three years," said Gross, who will attend the University of Akron in the fall and study chemical engineering. "Imagine how good it would be to practice three days a week. You're forced to do drills and that helps but once you get to a higher level, you actually need to throw. It stinks but you make the best of it and compete." Gross, however, is fortunate to have St. Joe's throwing coach Izeal Bullock III and Charles Infurna, an assistant coach at nearby Nazareth College, to guide him. Bullock also runs the Urban Fire Track and Field Club, for whom Gross has thrown over the summer, while Infurna works with him on weekends during the school season. Bullock worked with Gross extensively over the summer on form and that work not only showed during the summer but carried over into the fall and winter. Gross threw the hammer a career best 172-10 last July to finish 11th in the 17-18 Division at the USTAF National Junior Olympic Championships in North Carolina. Gross also finished second in the hammer (167-3) at the USATF Youth Outdoor Track and Field Championships last July at The University of Brockport. He also took second in the discus (PR 142-8) and third in the shot and javelin, respectively, in that meet. "The local summer meets aren't as much competition as the high school meets but when I got to the National Junior Olympics, that was the toughest competition I have ever seen," Gross said. Gross is eager to throw in college but isn't sure in which event or events the coaching staff will place him. He said he it doesn't matter, though, he's ready for the challenge and ready to continue to show that you don't need to be the biggest guy to be able to throw long distances. "I'm still not the strongest or biggest guy out there," Gross said. "But four years of working on technique and three years of [lifting] weights have helped me come this far. I'd really like by my sophomore year to win a MAC [Mid-American Conference] championship and compete in the NCAAs by the time I graduate and score in that. That's a goal of mine."